Now that the Liberal Mark Latham Is Gone, What of the Turnbullocracy? When Tony Abbott was elected as Liberal Party leader in 2009, I was astonished. I was asking why the Liberals were suddenly deciding their leader would be someone who was to the Liberal Party what Mark Latham was to the Labor Party. An attack dog. A vicious political fighter short on nuance and long on hatred and vituperation. On that day, I blamed his climate change denying, mining loving booster, Nick Minchin, for unleashing on Australian politics the worst leader in Australian political history. Even then, though, I couldn’t predict just toxic a force Tony Abbott would be on Australian politics. When Mark Latham ascended to the leadership of the ALP, one of the key features of his early days was his pledge to stop the crudity of his style, to ramp up the cuddliness. Hence the request of all people to read to their children and the call to end political entitlements. Latham at least made an effort to conform to expectations of our political system and ways of operation – even if it was unconvincing and was undermined considerably by his notorious handshake with John Howard on election day in 2004. Abbott, however, had no such interest in changing anything of his style and way of acting. 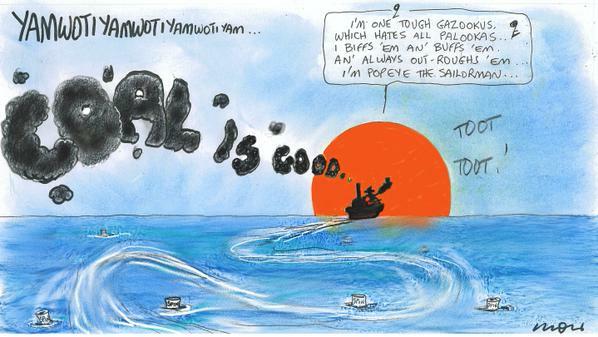 As Alan Moir so eloquently put it in his many cartoons of Abbott – As – Popeye, presenting the attitude of “IYamWotIYam” without any apology for offending people or ripping apart social and economic compacts that had been built for years and decades before. Abbott’s time in the leadership was marked only by wrecking those things that were necessary for a healthy, successful future of Australia’s society and economy, but didn’t feather the nests of the backers of the Liberal Party. Hence Abbott’s focus on stopping boats, stopping carbon pricing and stopping renewable energy investment and construction – his obsession with ripping down wind farms a particular symbol of his wrecking attitude. In its place, the bizarre comments on coal “being good for humanity” simply confirmed the reason for which he was leader – he was placed there to be the voice for climate change denialism and support for coal miners. In the face of this wrecking ball of hatred of the new, it became nearly impossible for other voices to present a nuanced, complex set of changes necessary. Hence Rudd’s propensity for verbosity in explaining the need for carbon pricing and other changes in the way Australia did business was cut down simply by the infantile repetition of “a great big new tax on everything”. The sad thing was for Australia was that the method worked. Opinion polls acted as a way to rewarding the wrecking ball style of politics Abbott brought to Canberra – and we saw Rudd and Gillard buckle in the face of the onslaught. There were visions to the Abbott leadership, however – there were his deeply internally unpopular “signature policies” – the paid paternity leave scheme and restoration of the royal honours system provided a direct link back to Abbott’s past as both a DLP President of the Sydney University SRC and his role as the head of the Australians for a Constitutional Monarchy. When they were both defeated – the latter hilariously so – it left me wondering just what was left for Abbott other than hatred for the new. As we saw with later cabinet meetings that were virtually bereft of new policies, there wasn’t all that much left. What was left, however, was the moronic nature of much of the Abbott support, both on a cabinet level and in the media. The simplistic, partisan chattering of the likes of Bolt, Jones, Hadley, Devine, Kenny, Paul Murray and their ilk were supported by the endless cycle of imbecility of Liberal Zombies on Twitter supporting the wrecking of anything perceived as being “of the left”, including Turnbull. In response, the Labor Megaphones were emulating this imbecility of a chorus of parrots shouting at each other. But what about now? What of Malcolm Turnbull having to navigate his way through the damaged hulk of a Liberal Party? It will be crucial for him to have a positive message and positive plan for the election in a year or so, because Australia has had a negative, destructive political culture for 6 long years due to Abbott. His cabinet changes seems to signal this change, with the dismissal of dead weight like Kevin Andrews and Eric Abetz and with the elevation of talent such as Marise Payne, Kelly O’Dwyer, Josh Frydenberg and Simon Birmingham in various key roles (the sound you hear is teachers celebrating the removal of Pyne from Education). Another positive is the restoration of a Ministry of Cities as a crucial part of a vision of repairing infrastructure issues – as was Turnbull’s statement at the announcement of his new cabinet about the importance of a mix of transport options – transport indeed is “not ideological”. Also positive was the reintroduction of a cabinet secretary, which seems to be a signal that Turnbull is stalking away from the days when Peta Credlin seemed to serve as an ersatz Cabinet Secretary. Problems, however, remain, such as hanging onto Peter Dutton as Immigration Minister (his biggest error) and not having a Disabilities Minister. It is clear that Turnbull isn’t the Progressive Hope that many hoped, despite all the evidence to the contrary. A moneyed Renaissance man of the Eastern Suburbs who believes in mildly moderate policies like marriage equality (like the Tories in Britain, amongst other nations) and a republic who wears leather jackets isn’t going to be guided by progressive voices in social media and suddenly be riding roughshod over the reactionary parts of his own party. If nothing else, he would have learnt that from his previous experience as opposition leader. Howard, too, learnt from his early experience as a reactionary opposition leader and embraced some forms of moderate policy making in his term as PM. Turnbull, too, will need to listen to any corners in his job in order to be a success. The difference is, though, that Turnbull has shown the ability to listen, especially to cross benchers. In that, his relationship with Richard di Natale will particularly intriguing. “The Baird Government and the Abbott Government and the Malcolm Turnbull Government will continue to invest in western Sydney and we will spend the $3.6 billion on infrastructure­ promised because whether it is connectivity over the internet­ or physically, it is critical for a modern city and its people to have the ability to be able to move around on good roads and public transport systems. “Malcolm has the capacity to inspire our nation and take us to the next level. “Tony created a lovely foundation. His vision for infrastructure­ was a brilliant starting point and foundation for our community. Malcolm Turnbull, with his background in technology and innovation, will be able to really realise the future­ of our country as an innovative hub. Ultimately, however, what we can hope is that what Turnbull restores is a more adult, sane political conversation and discussion of policy. I won’t miss at all the last six years of Tony Abbott, who can now happily dance shirtless out of the sight of all of us forevermore.